Named to Fast Company’s League of Extraordinary Women, Tiffany Dufu was a launch team member to Lean In and is Chief Leadership Officer to Levo, the fastest growing millennial professional network. She’s been featured in The New York Times, ESSENCE, O, The Oprah Magazine, and on NPR. She is a consultant to Fortune 500 companies, a sought after speaker on women’s leadership, and has presented at Fortune’s Most Powerful Women Summit, MAKERS and TEDWomen. She earned a BA and an MA in English from the University of Washington. She lives in New York City with her husband and two children. "There are two ways that a system of power stays in power. The first is obvious--unequal laws, unequal opportunity, very unequal money, and violence or the threat of violence--the second is more internal and difficult to uproot. 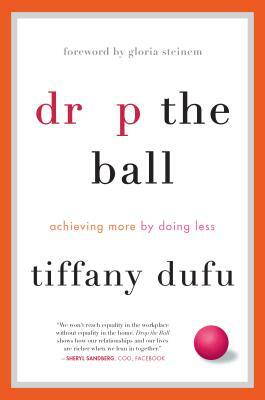 Tiffany Dufu's Drop the Ball is crucial because it takes on that deeper system. She is the right author for this important moment in time. She offers actionable wisdom to pass from one woman to another, from her family to yours. She not only shows that we all gain when women become part of, contribute our talents to, and are ourselves changed by the world outside the home, but also how we will gain when men become part of, contribute their talents to, and are themselves changed by the world inside the home. We need women and men who lead by example, as Tiffany Dufu does for readers on these pages." "We won't reach equality in the workplace without equality in the home. Drop the Ball shows how everyone benefits when men work towards equality -- and how our relationships and our lives are richer when we lean in together." "If you could follow a path to a stronger marriage, a happier family, and greater economic and emotional security, would you be interested? I thought so. Tiffany Dufu’s DROP THE BALL is that path. And she’s awfully good company along the way." "Drop the Ball is what so many women need to do but simply cannot bring themselves to. Tiffany Dufu writes with verve and wit, turning her life story into life lessons for all of us. A marvelous and instructive read!" "Drop the Ball is a must read for all women and girls. Tiffany Dufu reminds us that we must focus on what truly matters and let go of rest. She gives us specific tools and techniques to help us achieve our goals and live authentic lives free of guilt and regret." "Drop the Ball is thought-provoking, authentic storytelling. Through her sometimes painful, sometimes hilarious journey, Tiffany teaches all of us how to create meaningful lives. For women struggling with the demands of doing it all, and the men who love them, this book is refreshing and long overdue." "Finally, a book on work/life balance that actually answers women's questions about what the hell happens behind closed doors that works, rather than just lamenting that none of it is possible. Drop the Ball is accessible, vulnerable and optimistic." "Tiffany Dufu's wise personal story offers real solutions for women who are struggling to be all things to everyone -- both at home and at work. I would have loved to have had Tiffany's warm, funny, brilliant voice in my ear when I was getting started in my career and juggling the demands of a growing family. DROP THE BALL is full of useful advice and it is an empowering manifesto for all women looking to lead balanced, happy, successful lives."